Well you can take solace in knowing that once orders open again and you get one that it’ll been worth the wait. I was really hyped for whatever Mannequins had been working on for the last several months. Then the “w/” was released to my confused disappointment. My first thought was, “well I can do that 10 times better with the ER-301, right?”. Now that my last hopeful yearning was a flop, my sights are set on the ER-301. I totally get that you’re bummed about the ER-301 being out of stock, but it’ll be worth it. 1 man operation - I have no idea how Brian does it! There are a few things that the Mannequins module does that aren’t quite the same/possible on the ER-301, mostly around speed changes and cueing loop points on the fly while recording. That being said, there are some things on the development roadmap that may change that one day (no guarantees, of course). I’d say the W/ module seems closer to the Morphagene in spirit. Yes! I’m also waiting eagerly, reading so many of this forum’s informative threads. But as jonny said, gotta respect and be patient/supportive with a one-man-in-Tokyo operation :–). Yes! I’m also waiting eagerly, reading so many of this forum’s informative threads. What’s the first thing you’re going to do with it? Myself, I’m most interested in sampling and replacing the role of my Octatrack, which seems to have become something of a second-class citizen in the Elektron lineup. I also use a lot of alternative tunings in my music. Being able to use my existing v/oct tooling (instead of MIDI hacks) to control four tracks of sample playback is really appealing. I’ve got good news; the number of sample playback tracks is unlimited, you can add 10 samplers to one track. of course CPU and number of CV inputs pose some limits. I have effectively replaced the audio side of the Octatrack with 2 ER-301s. I haven’t really looked back! What it doesn’t do is replace the sequencing or the Midi capabilities of the Octatrack. For that you have to look elsewhere and it’s not easy - in my opinion the Stillson Hammer mk][ is the closest to the Octatrack sequencer, ad Scott from The Harvestman confirmed it was inspiration when he was designing the SHmk][, but it’s definitely not the same. I’ve heard you say that a few times Kel, can you broaden that description? I’ve been fascinated by the octatrack for years, but always put off by the (many) criticisms of it. A good few years back the Aussie dollar was over parity with the USD and during a sale an octatrack could have been had for $1000 AUD. I see well used MK1’s now on the second hand market for $1300, so I certainly would not have lost money on it! I don’t know the methodology, and it seems incredibly diverse in the way people use it, but can you give me examples of how you replicate funtion with the ER-301? I’m imagining a feedback looper (and it’s buffer) akin to an incoming machine (not sure of OT nomenclature) on an OT and then Manual Grains, Grain Stretch etc…like other tracks on the OT. I’m still considering one as useful for audio mixing/processing as an end of eurorack chain device, but they’re now $2200 AUD for the MKII, and comments like your make it seem like too much for what’s on offer. That’s easily reproducible on the ER-301, okay, you’re not going to get it exactly the same, but in principle it inequivalent. But it’s the ER-301 and not and Octatrack, so you can set a channel up however you want - infinitely more possibilities. For each parameter you can set its value on each step independently of wether or not a sound s triggered on that step or not. It’s a bit like Korgs automation and you can use it in a similar way, hit record, wiggle a knob and the values are recorded to trigs. Of course they are editable. The MIDI side of it is really good too. Unfortunately as I am sure you’re aware - the bottle neck between MIDI and modular is all too narrow! The A4 is the one for modular, the CV out section on it is brilliant! Unfortunately it’s just one channel. If Elektron ever release a 4 channel CV sequencer that is exactly the same as the CV sequencer on the A4 I’d buy it in a heartbeat! Second hand mark i A4’s go for about 1k here, so it makes more sense to try out sequencing compatibility but, as I say, the capacity to mix eurorack audio (and use effect sends) is pretty attractive. As you begin to explore Teletype sequencing capacities, do you think you may be able to emulate some of the Octatrack functions there? The FX on the A4 are great and the inputs handle modular levels really well if you set the gain staging right - it’s a nice round trip, A4 sequencing modular -> modular out to A4 FX! Sure… without a doubt! All it is is set this parameter at this value on this step - for lots of parameters - totally doable - perhaps not as intuitive and will certainly require a lot more planning though. A4 sequencing modular -> modular out to A4 FX! perhaps not as intuitive and will certainly require a lot more planning though. Yeah, I also have the feeling that the Teletype ultimately leans more toward the random…that being said I’m making significant use of the 4 track sequencer and finding it very intuitive and quick way of working live. March was just too optimistic…hopefully May. I hope everyone is enjoying the transition from winter to spring. This is just a small status update to let you know what is going on with the next ER-301 production run. I am experiencing a rather lengthy delay trying to get the last remaining crucial parts for the next run of ER-301. 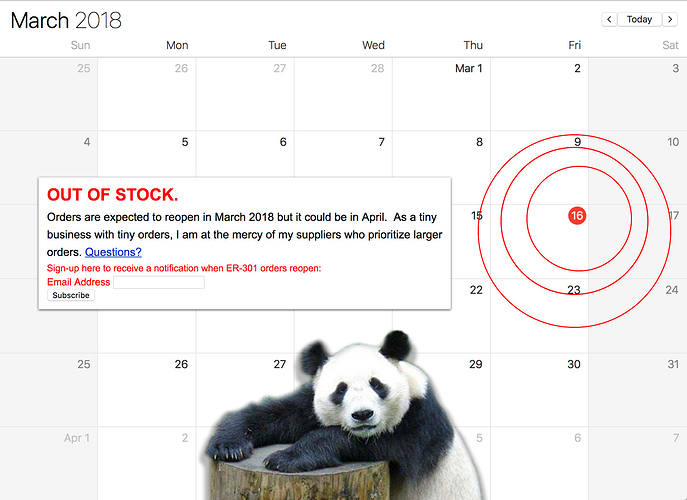 I’m being told to expect the delivery in May. In the meantime, I might be able to get a few dozen of these parts earlier for a small run during the end of March or beginning of April but the larger run (which should keep me in stock for at least 6-8 months) will most likely have to wait until late May. I will let you all know as soon as this smaller run happens (if it happens). I apologize for having to extend the restock date but as an extremely small manufacturer, these things are mostly out of my hands. If there are any substantial changes, I’ll let you know. Thank you for your patience and support. Thanks for the update Brian. I find myself really curious about what the “last remaining crucial parts” might be, and how easily they might be stolen from the back of a van. Desire is the root of all suffering. I am the embodiment of patience. Deep breath. I find myself really curious about what the “last remaining crucial parts” might be, and how easily they might be stolen from the back of a van. It’s a bit of rare meteor that fell to Earth. Presumably from outer space. Seriously though, hope there’s a small run for the wait list and you get into it. I think the Teletype approach is more algorithmical than aleatoric. It is WAY more powerful than it first appears and certainly much more powerful than the Octatrack sequencer. The only limitation is that you can only be outputting 4 cv and 4 gates at a time, but the expanders help there. The only limitation is that you can only be outputting 4 cv and 4 gates at a time, but the expanders help there. …and if you are driving the ER-301 - you can use i2c which opens up 100 TR ports and 100 CV ports! True! I have only really checked my i2c connection works - no scripts yet because I’m still learning the basics of the 301. Getting a TT, 301 and Just Friends within a few weeks of each other has really set me back. Couldn’t be helped though. Anyway, this is the waiting list thread. All I can add is that it is worth the wait and patience is a virtue. Yeah, i was a little simplistic in my suggestion. Algorithmic definitely more appropriate.